Back in the Philips Curve Conundrum we flagged the gap that has developed between unemployment and wage growth. This phenomenon was one of the subjects of last week’s TFTD and was thrown into sharp relief by the Fed’s April Beige Book, which highlighted pervasive labor shortages. With that as the backdrop, today’s Richmond Fed Survey of Manufacturing Activity made quite a splash. This is because while the headline number missed horribly, coming in at -3 versus the expected reading of 16 (what this means for manufacturing is something we may dig into in future issues), capital expenditures and most importantly wages both hit the highest levels in years. 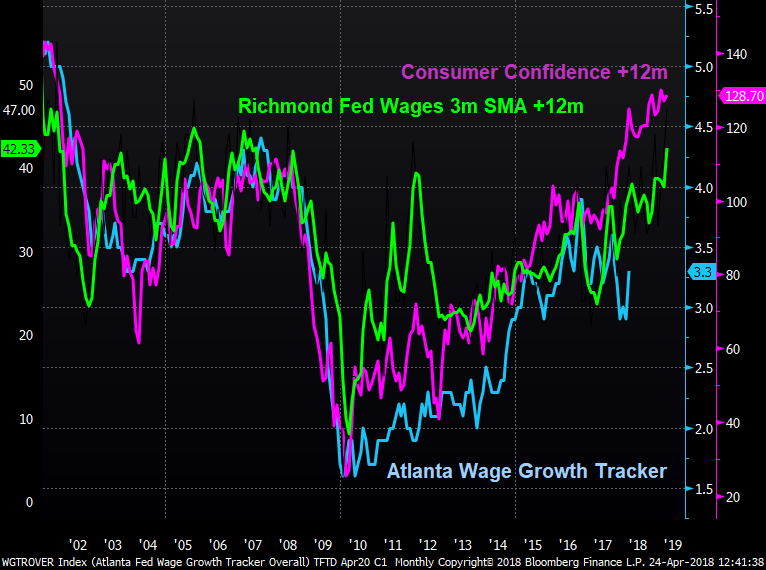 This bodes well for wage growth and is buoyed by the Conference Board’s latest Consumer Confidence reading, which appears to be unstoppable as it moves from the bottom left to upper right. If this data is to be believed, wage growth should move up above the 3.5% YoY level. Anecdotal evidence affirms tightness in the labor market is forcing companies across sectors to find ways to entice and retain employees. In retail, Walmart has relaxed its dress code policy, and in the transportation sector, which is well above its pre-GFC high, as shown in the chart at right, Union Pacific and BNSF (another railroad company) are offering massive bonuses. Continued efforts to address non-performing loans (NPLs) resulted in an overall decrease in the NPL ratio for banks under ECB supervision from 6.5% to 5.2% in the third quarter of 2017. Notwithstanding these positive developments, a number of structural challenges continue to dampen banks’ profitability prospects. These include, to varying degrees across countries and banks, cost inefficiencies, excess capacity and a lack of income diversification, while NPLs still remain high in some countries. continue putting pressure on problem banks using existing powers. 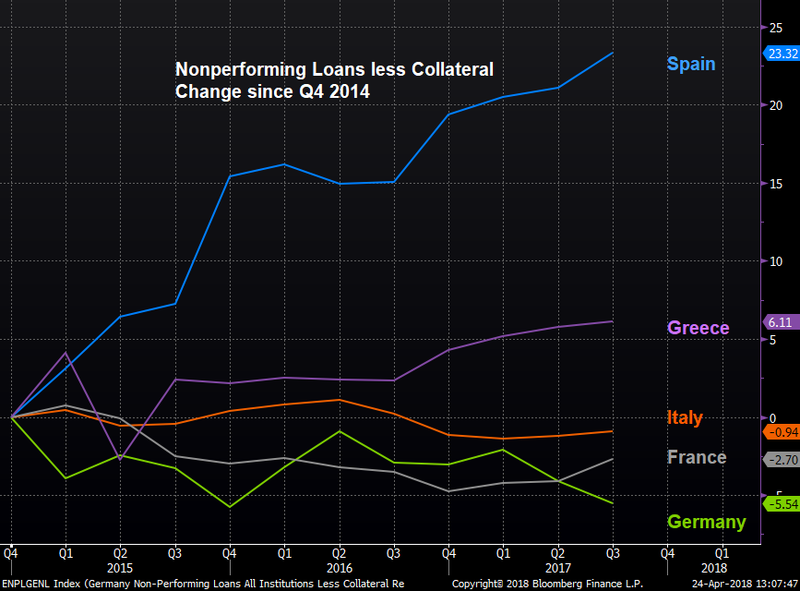 With NPLs already putting pressure on banks, as highlighted in our TFTD on Monte dei Paschi, we will see if, given an inch, delinquent European banks take a mile.